Editor-in-chief and CEO of An-Nahar Nayla Tueni with its blank issue on October 11, 2018. IMPERMANENCE IS A PERMANENT CONDITION IN BEIRUTa horizon of transience continues to shape its residents’ daily lives. While survival mode may appear inevitable here, a good number of Beirutis in the arts have ceaselessly cultivated self-criticism as a structuring ethos of their professional practices over the past two decades, braving Syrian oppression, Israeli assaults, a far-from-resolved garbage crisis, and, still ongoing, the protracted lack of an elected government, not to mention increased state surveillance. Although post-civil-war amnesia among the Lebanese and the constructedness of any given history have been the most popular objects of critique, a push to extend this criticality to the present moment, especially along the lines of a more direct self-criticism, has grown evident amid the stalemates and growing pains of the scene. The jury also noted the almost complete absence of works that deal with recent regional events/disasters/debacles/sequelae. Why is that? Is it that it is too early for any of the latter to be integrated into an artwork, for example, because there has not been enough time for one to forget and then for it to nonetheless return? . . . Or is that almost none of those who submitted work to the Salon are concerned with this region and not with solely Lebanonwould that have been induced, paradoxically, by the obstruction of Lebanon’s political horizon? Distinctly Toufician in nature for its poetic inquisitiveness (Jalal Toufic himself was on this year’s jury), this set of questions seemed to address not just the roster of participating artists, but all of Beirut’s art scene. They are not easy questions to answer. All the same, they qualify one’s understanding of self-reflexive artistic practices in Beirut: the desire to take stock, to classify, and to organize. Defining, redefining, and lingering on the building blocks of a medium can serve as an internal-audit process crucial for the continuation of a practice. Akram Zaatari’s most recent solo show at Sfeir-Semler Gallery in Beirut is another case in point. One standout piece in the exhibition, The Third Window, 2017, is an enlarged photograph of a four-by-five-foot Ektachrome transparency featuring a digitally emptied-out, cheap gold frame. This frame would have normally enclosed a photograph of Nahla Haidous, who was killed during a 1996 Israeli air raid against a UNIFIL base in Qana. At the time of her death, when Haidous’s family needed a photograph of her to put over the grave, they had preferred to stick plastic flowers directly on top of the frame to cover her hair, as her portrait dated from a period when Haidous was not wearing the veil. A framed reproduction of this photographnow featuring its plastic accessories flattened on top of the original imagewas made by her family, after Doha Shams, a reporter, expressed interest in publishing it in a special supplement of the now-defunct newspaper As-Safir. Finally, the Arab Image Foundation (AIF) produced an Ektachrome transparency from this reproduction for the (predigital-era) press kit of the institution’s first-ever exhibition during the 1997 Rencontres photographiques d’Arles. Akram Zaatari, The Third Window, 2017, C-print, 54 x 39’. Behind its deceptively simple appearance, The Third Window retains relics of complicated social, political, and institutional historiesa continuum of what Zaatari calls “transactions.” The artist’s interest in such “transactions” does not result from a blind archival impulse or a belated fetishization of bureaucratic gestures. 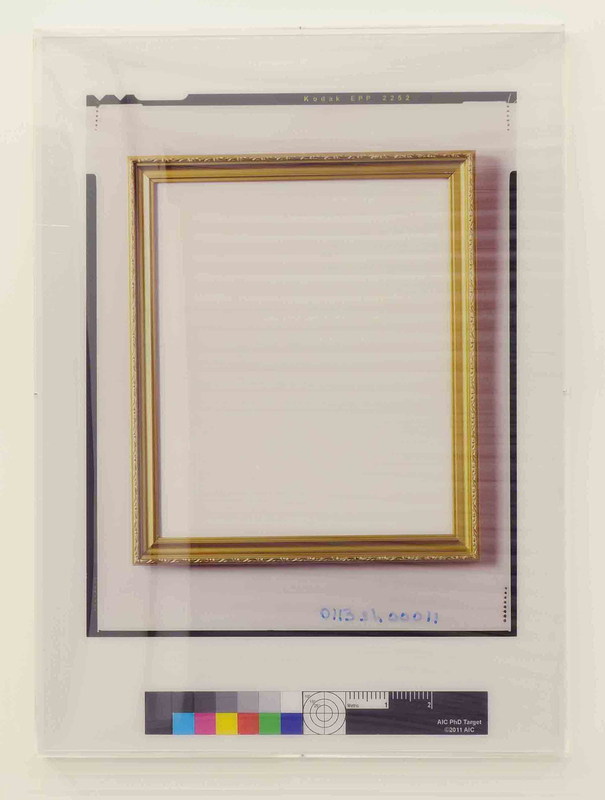 With the removal of the subject matter from the image, AIF’s color-correction card and, more importantly, the object’s inventory number (0113sh0011) loom large as silent witnesses to the time this storied document spent in archival purgatory for not being an “original” photograph. (The inventory number indicatesdespite having arrived very early at AIFthe object was part of the 113th collection to be processed at the institution.) Zaatari, a cofounder of the Foundation and the current president of its board of directors, may have built an important part of his artistic practice on and around AIF’s holdings, but in The Third Window, ghosts of institutional shortcomings and a latent indigestion of vernacular imagemaking practices fill the empty frame. During his lecture at Ashkal Alwanhome of the famed Home Workspace Program and Beirut’s premier art happening, the Home Works Forumin September, Zaatari mentioned, in a matter-of-fact tone, that AIF had drawn up emergency plans for various catastrophe scenarios, including the bombing of its premises: “You decide on what goes out first.” Provisions included the transfer of collections to the nearby Sursock Museum, but some collections have already left the building before the advent of a disaster: Zaatari’s Iraqi Ruins, 2017, dwells on one such collection on loan from its owners for a short to medium term period. After AIF failed to fundraise the sum for the digitization and upkeep of more than eighty thousand negatives and prints that belonged to Iraq’s most celebrated modernist architect, Rifat Chadirji, his collection was donated to the Aga Khan Documentation Center at MIT in 2016. In Iraqi Ruins, six empty binders lay flat open with spectral impressions of Chadirji’s contact sheets on the inside covers. Often shaky, like a double- or triple-exposed photograph, they exude an exquisite fragility and mourn the passage of not only Chadirji’s collection after four years, but also the material and immaterial heritage of midcentury Iraqi modernity. With the US government shutdown overat least for nowin its second month, Lebanon remains without a functioning cabinet eight months after the May 2018 elections. Although the Lebanese may be more experienced in functioning under such complete blockage of what the Sursock Museum wall text called their “political horizon,” petty negotiations for more powerprompted and sustained by the country’s clientelist confessional systemare less and less tolerated, even by those traditionally grouped with “the establishment.” It comes as no surprise that the country’s most prestigious and widely distributed daily, An-Nahar, could (and did) print a blank issue on October 11, with its editor in chief and CEO, Nayla Tuenia former MP herselfdecrying the self-serving agendas of political parties at a press conference the same day: “An-Nahar is tired of printing your excuses and your repeated empty promises. . . . We have been waiting for five months for a government while we watch your games of dividing shares.” The empty issue of An-Nahar is a sign of exhaustion as much as it is evidence of deep introspection: This blank slate is not the outcome of amnesia, but rather constitutes a gesture of taking stock and purposeful remembering. When exception increasingly reigns as the norm around the world, this insistence alone can propel us to a future, but it will take everyone.